Sakai Guides and DocumentationSakai Complete User Guide ResourcesHow do I upload a new version of a file in Resources? 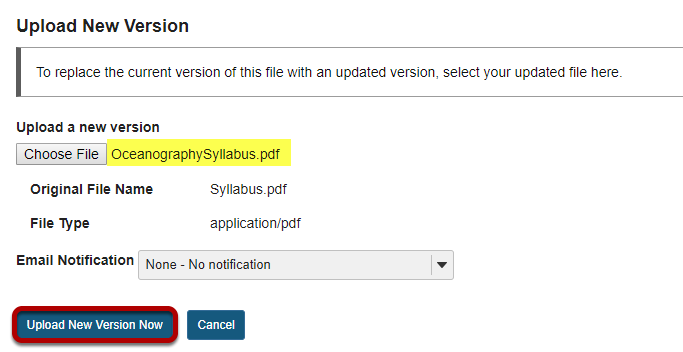 If a file is linked and active elsewhere in your course site - such as in a Lessons module or an image in a quiz - deleting it from Resources and uploading a new file in its place will break the link. By uploading a new version, your existing links remain intact. Click Actions, then Upload New Version. Zoom: Click Actions, then Upload New Version. 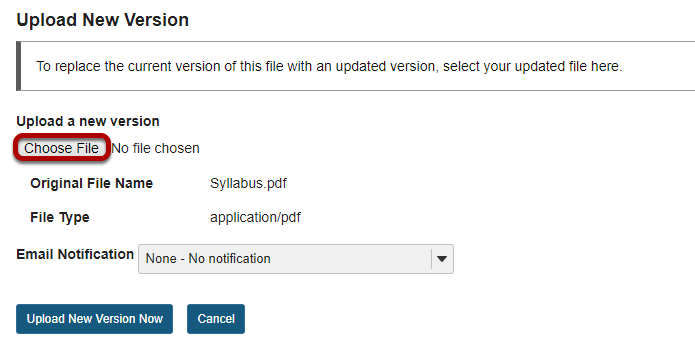 To upload a new version of a file, to the right of the file to replace, from the Actions drop-down menu, select Upload New Version. This displays the Upload New Version page. Click Choose File to locate and select the file on your computer. This returns the display to the Upload New Version page with the name of the new file. Click Upload New Version Now. The file name of the new file is displayed. Zoom: Original file is replaced. This replaces the original file with the new revised file. Note: The display name for the new file remains the same as the original file. Prev: How do I reorder files or folders within Resources? Next: How do I hide files and folders?